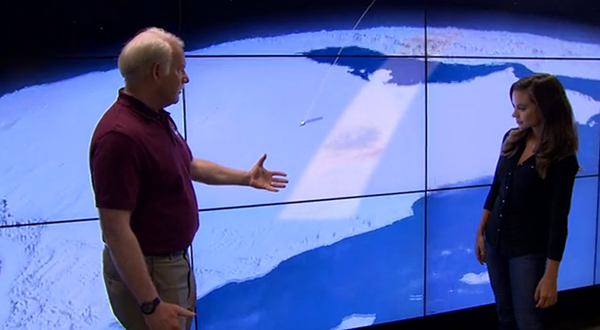 Irons talking to Calandrelli about Landsat during the Xploration Space Satellites episode. Nov 15, 2014 • Xploration Outer Space aired an episode on satellites today. To answer these questions, host Emily Calandrelli learned about communication satellites at Space Systems/Loral, as well as the Landsat series of satellites and IceSAT at NASA’s Goddard Spaceflight Center, and lightweight Cubesats that can hitchhike to space with larger satellite launches. The satellite episode of Xploration Outer Space (Season 1, episode 10) can be viewed on HuluTV; Information about Landsat starts at time stamp 9:06.